Abnormal body weight, comprising of underweight and obesity, is a global healthcare problem in both the developed and the developing countries. Obesity is common among the low socioeconomic class in the developed nations, but seems to be rising in both the high and low income groups, among urban and rural dwellers, in the developing nations. Underweight is still relevant as its prevalence is high in rural areas, linked with infections and malnutrition. Some factors have been linked with obesity and some with underweight in the general communities in both urban and rural dwellers. Adults who attend the general out-patient clinics may have some medical problems linked with abnormal weight, factors which ordinarily are not noticed by them and do not constitute in any form the reasons for which they present in clinics. Such factors, if undetected and unaddressed, may influence the overall health conditions of the patients. This informed our decision to determine the presence of abnormal weight and the factors which influence underweight and obesity in people attending the general out-patient clinic. We assessed abnormal weight and the potential linkages that might influence underweight and obesity in the general clinic population in Federal Medical Centre, Owerri, Nigeria. Body mass index (a measure of weight/height2) was determined. Underweight, overweight and obesity were defined according to WHO criteria. Here, we put all classes of obesity as obesity. Their blood samples were tested for anemia, abnormal cholesterol and kidney function. Their urine samples were tested for abnormal density and protein (both indicators of kidney damage). In the patients studied, females were more in number than males. Those who were underweight constituted 10.3%, while those obese were 30.1%. Body mass index was linked with urine density, serum cholesterol, anemia, and urine protein. 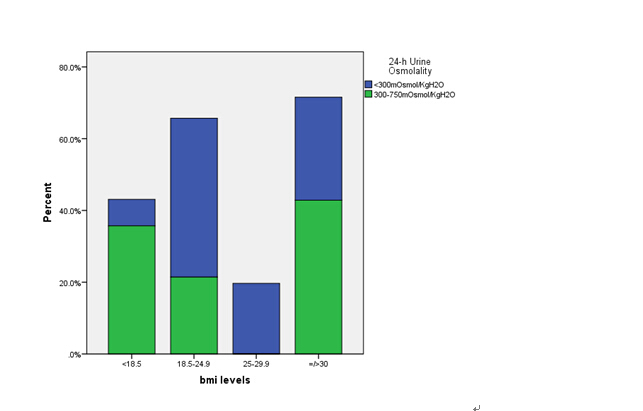 Obesity was linked with urine density, and serum cholesterol (Figures 1and 2). This study showed that the occurrence of underweight was high in the general clinic population. However, some researches have reported a higher underweight occurrence in rural India and Nigeria, in community-based studies, differing from ours that was carried out in a general clinic population. In addition, they studied apparently healthy people, while we evaluated out-patients who might have latent medical conditions, unrelated to the principal complaints for which they presented in our clinic. Underweight has an influence on anemia, while obesity was linked with abnormal cholesterol. Abnormally low urine density and urine protein were common in those with abnormal weight. 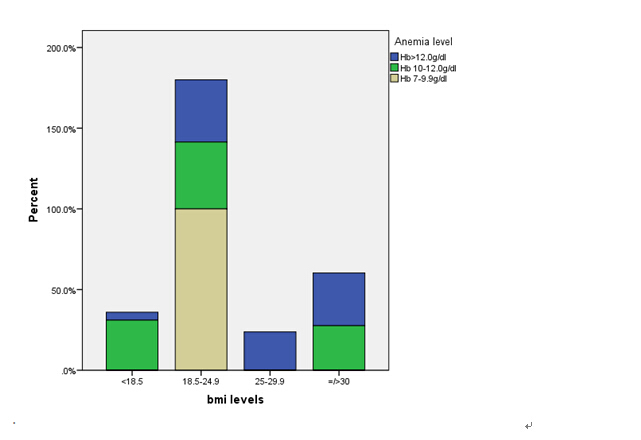 We concluded that underweight and obesity were common in the general clinic population. Anemia, abnormal cholesterol and kidney damage were common among patients with abnormal weight. It is therefore recommended that doctors should routinely assess body mass index and search for anemia, kidney disease and abnormal cholesterol in those with abnormal weight attending the general out-patient clinics. Dr EN Anyabolu, Department of Medicine, Imo State University Teaching Hospital, Orlu, Nigeria. Department of Medicine, Federal Medical Centre, Owerri, Nigeria. Department of Medicine, Chukwuemeka Odumegwu Ojukwu University Teaching Hospital, Awka, Nigeria. A paper about the study appeared recently in American Journal of Internal Medicine.